This is the bulletin board that greets the children when they enter our classroom everyday. It was designed around the Magic Tree House book series. It is a great reminder that everyday is a learning adventure! I created the tree trunk using bulletin board paper and crumpled it for a more realistic look. 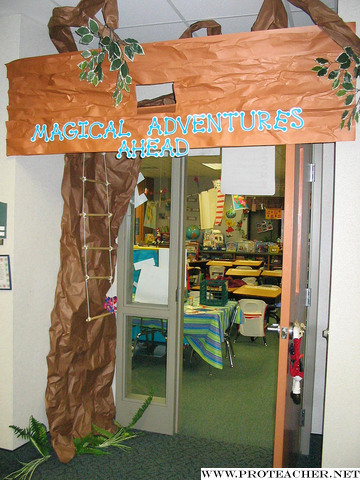 The leaves are greenery that came from a fake tree and the tree house itself is made from bulletin board paper as well. The ladder is bamboo and string. Since the series can be used as a starting point or an ending point for a thematic unit, this is a bulletin board that is terrific for utilizing prior knowledge and for reviewing past units.